The exhibition of my work from ob•serve, my residency on Skokholm Island, is now on show. 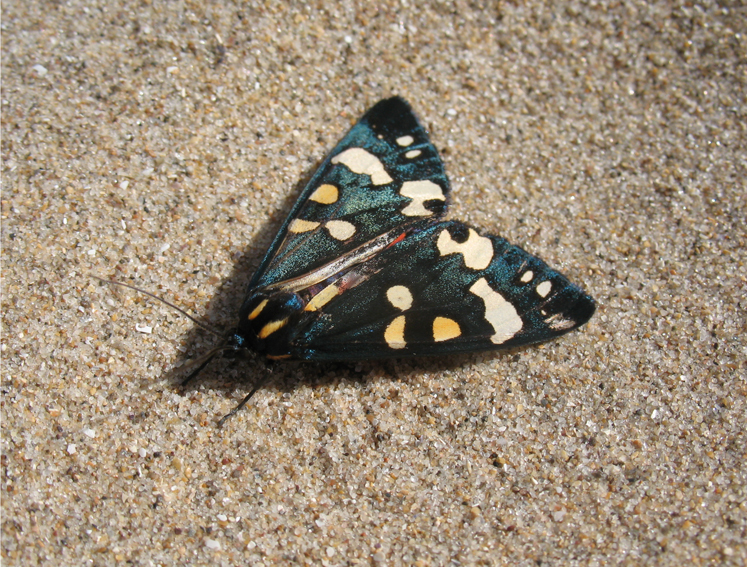 I am grateful to Arts Council of Wales, The Wildlife Trust South and West Wales, Pembrokeshire Coast National Park, Oriel y Parc, Dale Sailing Company and Richard and Giselle, Skokholm Island wardens, for their support of this project. 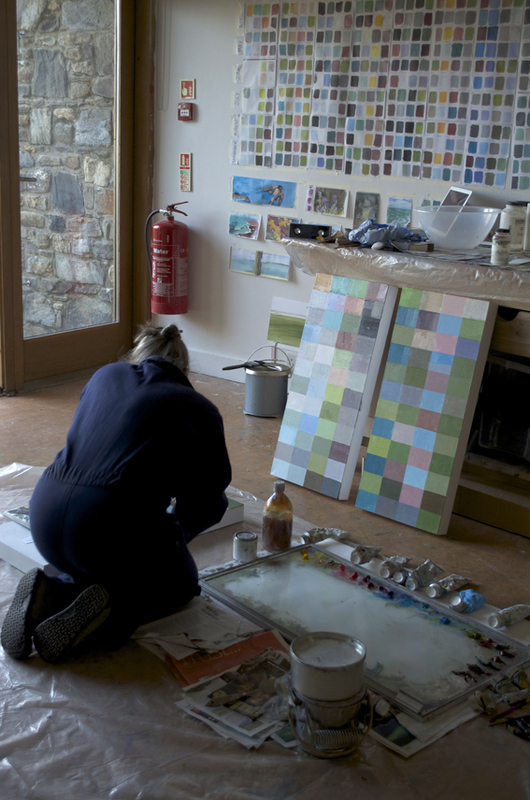 I am now half way through my month long residency at Oriel y Parc in St. Davids. 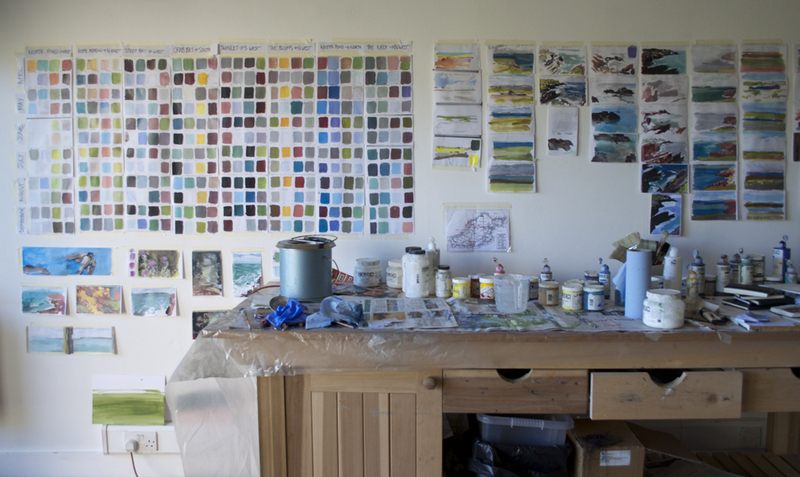 It is wonderful to have such a beautiful big studio in which to begin to process the material from ob•serve, the project I have been researching over six months at Skokholm Island Bird Observatory. The work I am doing will develop over the winter and will be the basis of an exhibition in The Tower Gallery, St Davids, next summer. 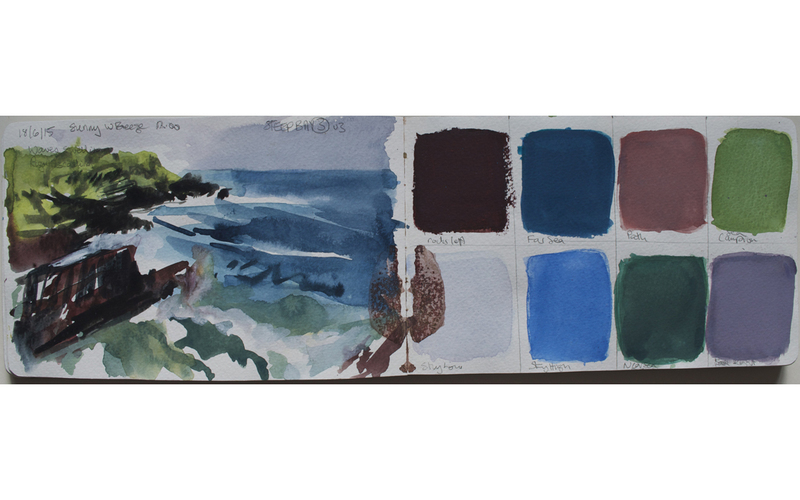 I decided to focus particularly on my sketchbooks and the colour “transect” studies. I chose eight sights around the island which I visited every month from April to September and recorded the colours I could see, this now forms the basis of a series of canvases I am painting in oils. The residency is teaching me some unexpected things: the benefits of having a studio away from home, of having people around and a context to work in which is less isolated (and has an excellent cafe! ), the importance of having clear space and the value of having a routine of going out to work and stopping at 5pm. As a result I have resolved to have a clear-out of my studio and gallery and to reorganise my workspace at home, especially to make space for painting. This means that I will be having a massive sale of work this winter which will (hopefully!) free up space. I will be giving a public talk about this work at Oriel y Parc on Friday 16th October at 6pm, and also welcome visitors to the studio 4-5pm on Thursdays and Fridays (other times by arrangement). On Saturday 21st November I will be running a one-day painting course focussing on colour at Oriel y Parc. To book phone Oriel y Parc on 01437 720392. I am immensely grateful to The Arts Council of Wales for funding this project which is allowing me to take the risks necessary to develop my work, to The Wildlife Trust, South and West Wales and the Skokholm Island wardens for giving me the chance to work on the island, and to all the staff at Oriel y Parc and Pembrokeshire Coast National Park for making me so welcome in St. Davids. We have been treated to some superb snow this month. The past few months has been a busy time for teaching. 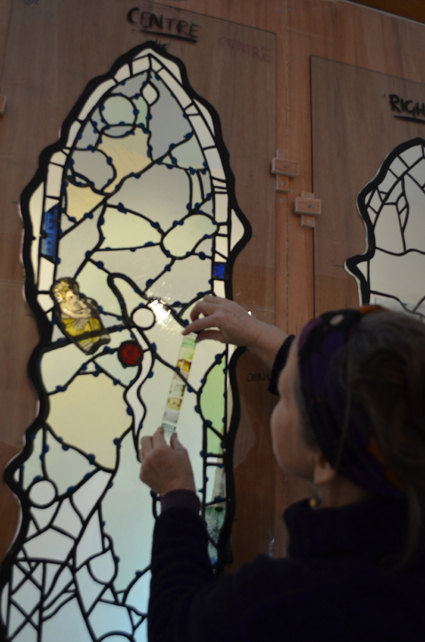 I have done a number of glass projects in local primary schools. 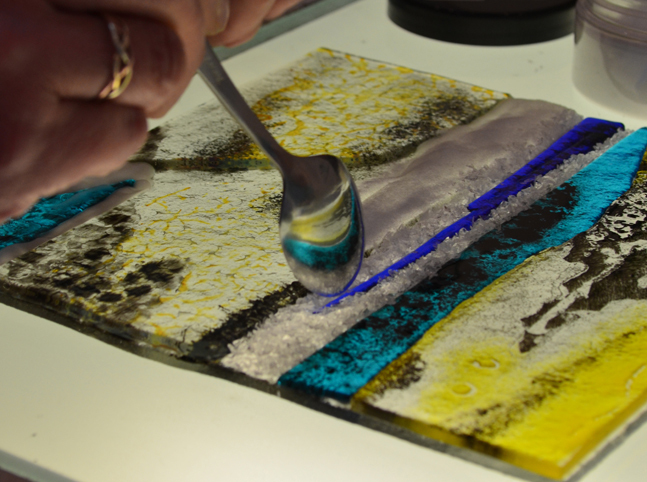 I love this work, it is so inspiring to work with children and get them enthused about glass! 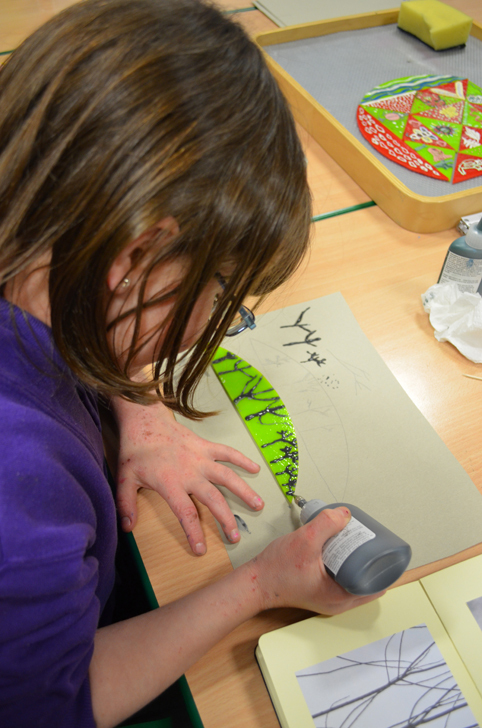 One particularly inspiring project was to make 2 bowls with kids at Ysgol y Frenni on the theme of “patterns in the environment” (or “patrymau yr ymgylchedd” as the entire project was undertaken through the medium of Welsh!). I designed this as a patchwork of glass so that each child could work on their own design and then we could put them together to make a group piece. 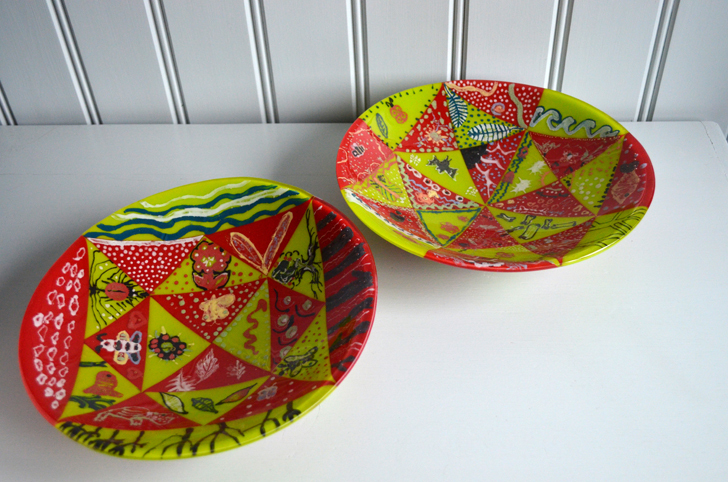 The bowls will be entered in the Urdd Eisteddfod in May. 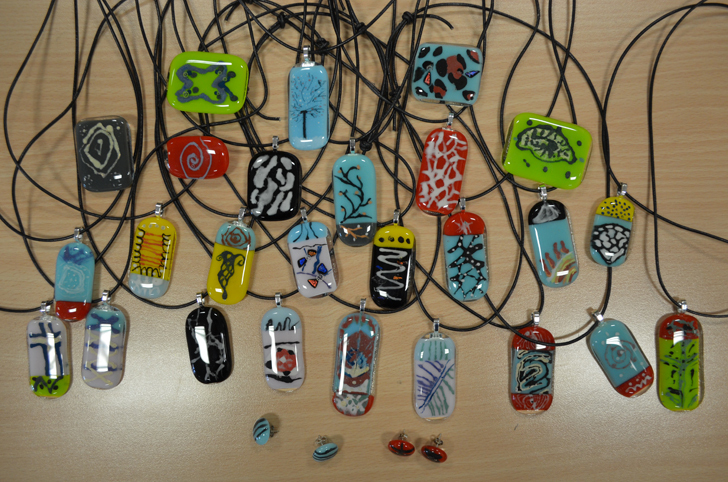 In another project we made fused glass jewellery on the same theme. The kids were so enthusiastic, they said it was their favourite day at school EVER!! 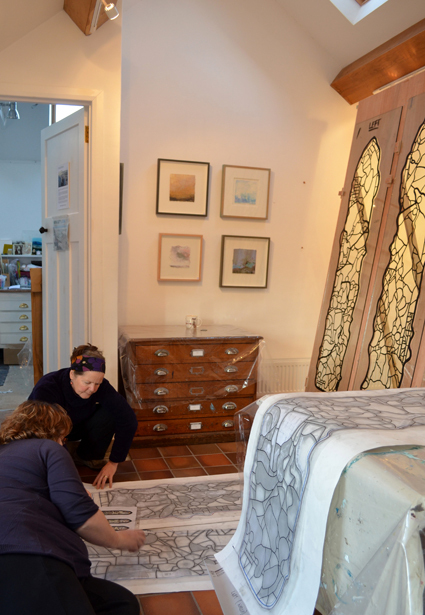 Rachel and I have just run a “Landscape into Glass” 4 day course at my studio here in Pembrokeshire. We were teaching our students mark-making and layering techniques and ways of working with firing paint, silver stain and frits in combination with pieces of Bullseye glass. We are planning another course for later in the year. 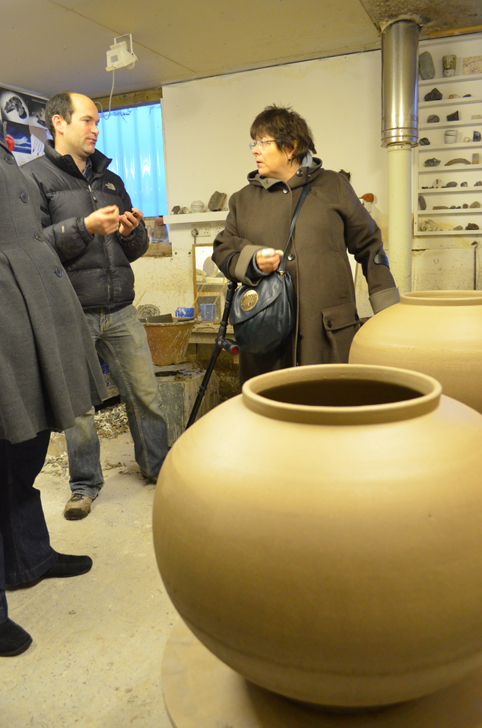 We had a couple of field trips to absorb the landscape and to visit local artists studios, like that of ceramicist, Adam Buick and glass artist, Steve Robinson. The course was very successful and we are planning another for next year. 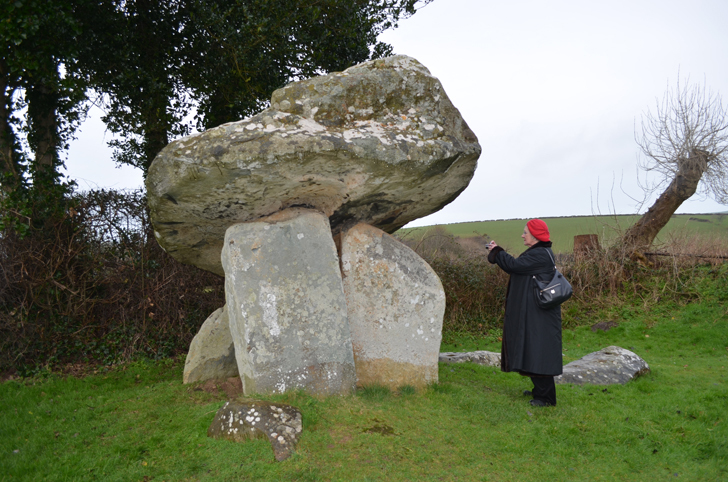 Visiting Carreg Coetan, a Neolithic burial chamber in Newport. 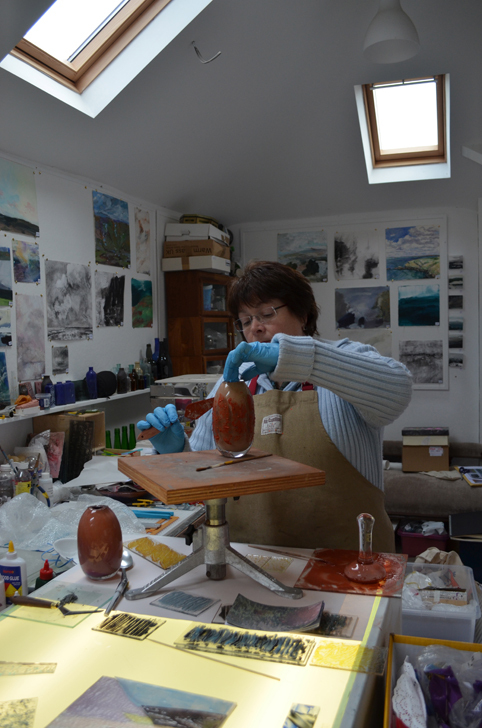 Apart from that I have been developing some new work in the studio looking at taking painting into glass. 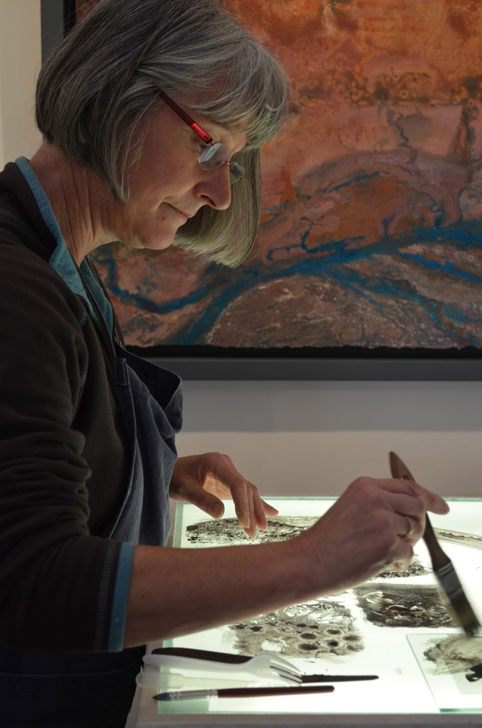 Sarah Harman and I have been working on our quarry project, having meetings with the National Park and technical specialists to help us hone down our ideas and firm up our budget so that we can apply for funding to make and present the work in 2014. I have just heard that I have been successful in my funding bid to Wales Arts International for support to attend the American Glass Guild Conference in Florida in May where I have been asked to give a paper and run a workshop. I am planning a trip that includes visiting glass artist friends, Jane Bruce and Michael Rogers and spending time at Corning Museum of Glass and in New York. 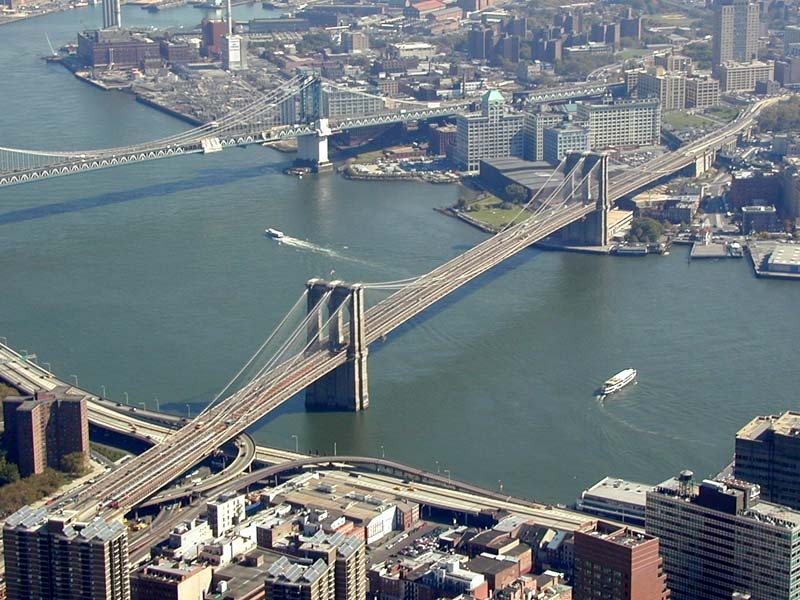 It will be a very inspiring trip, my first time in America, and a total contrast to life in rural West Wales! The trees are totally magnificent at the moment! 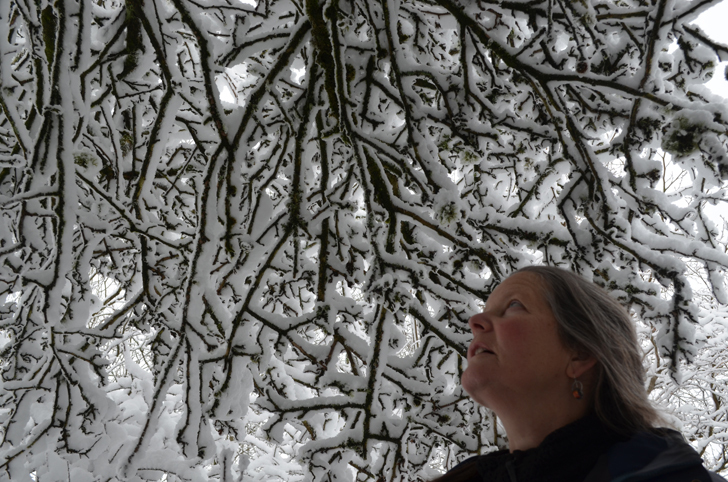 I love winter and am enjoying the crisp and the soggy days and soaking up inspiration for my work. A very exciting development is that I am going once a week to the Department of Architectural Glass at Swansea Metropolitan University where I have a Visiting Artist arrangement whereby I exchange working with the students for access to the facilities and expertise in the department. I am working with the first years on their “Decorative Processes” module with the fabulous Lisa Birkl. It is wonderful to go there and for one day a week to concentrate solely on playing with ideas. It makes me realise how much of my time at home is taken up with admin, writing proposals, answering emails and generally making a living, and how rare it is to have uninterrupted creative time right now…I can feel a New Year’s resolution coming on! This term I have been playing around with the sandblaster, developing my skills and trying things out. I am definitely going to invest in a sandblaster soon. Alongside this I have been developing my work in Welsh and English medium local schools and have made a total of 200 glass Xmas decorations with pupils aged 3 to 11 over the past month. 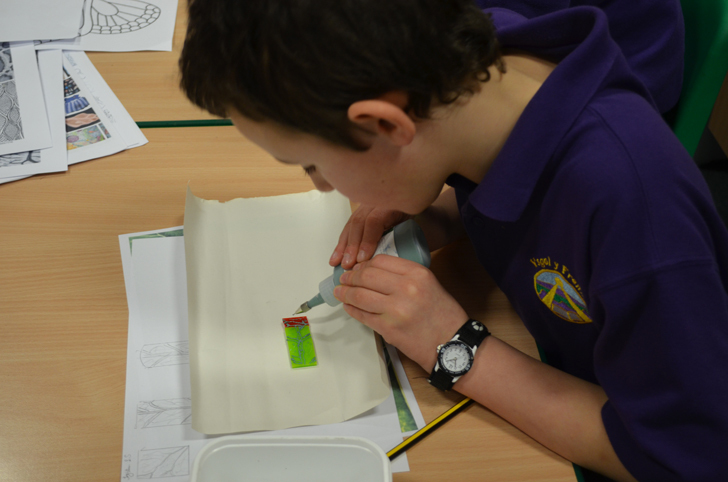 It has been fantastic to work with the children and to spread the word about glass to a new generation! Their work is beautiful. 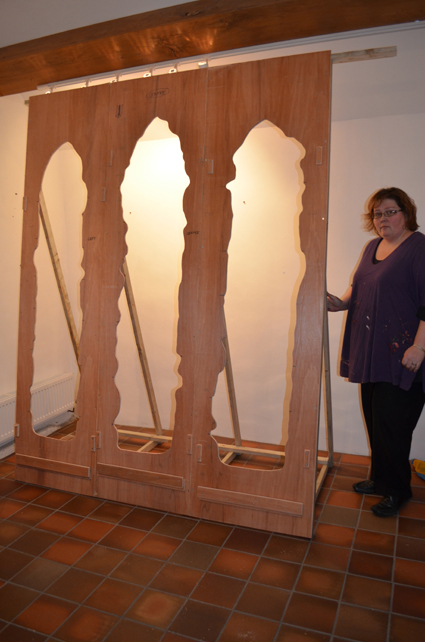 This has been quite a year for me from installing the Conwy Castle commission, winning the Warm Glass Prize, going to the Northlands symposium, collaborating with Sarah Harman on the Rosebush project, studying with Antoine Leperlier, and now working in Swansea – I am really beginning to feel things start to come together. 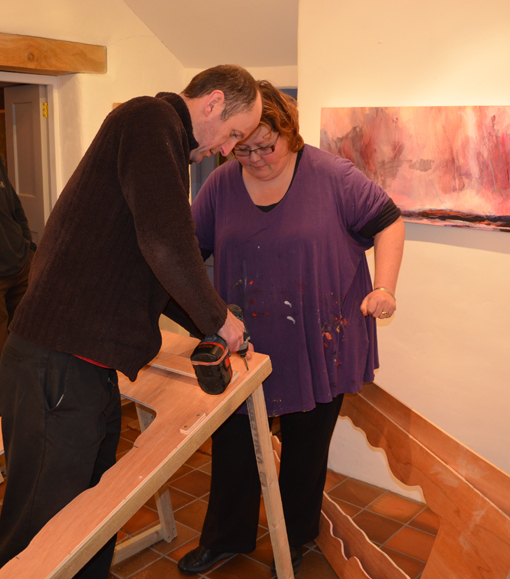 I am now putting the final touches to my New Year show ready for the opening on 27th December. 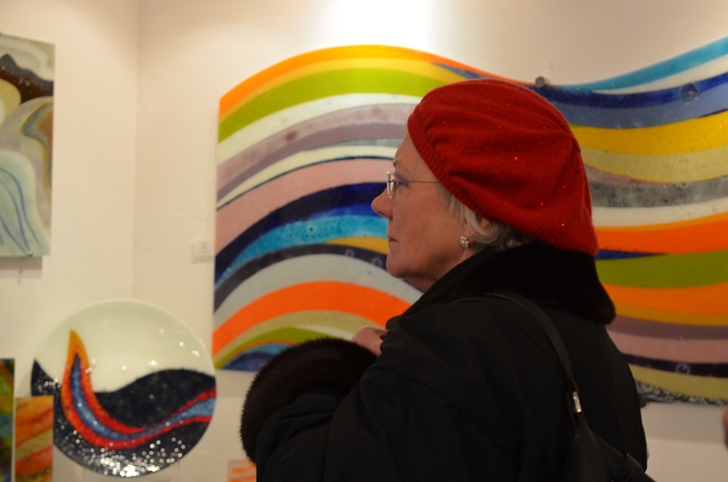 For the first time I am showing a series of glass panel alongside my paintings. Pop in and join us for a glass of mulled wine from 27th december – 7th January. 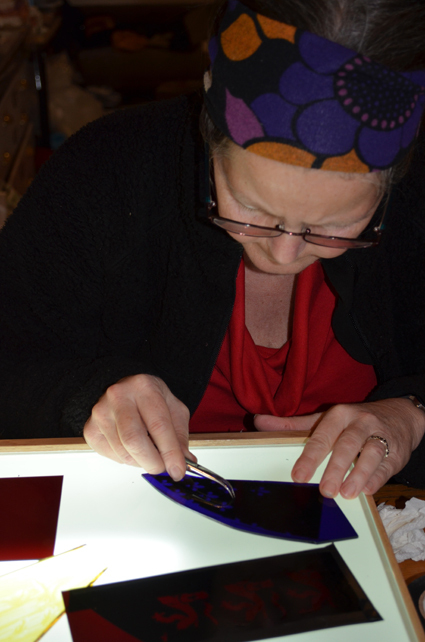 The gallery has been converted back into a stained glass workshop and the wonderful Carwyn has constructed fantastic easel light boxes to enable us to work on all three panels together. 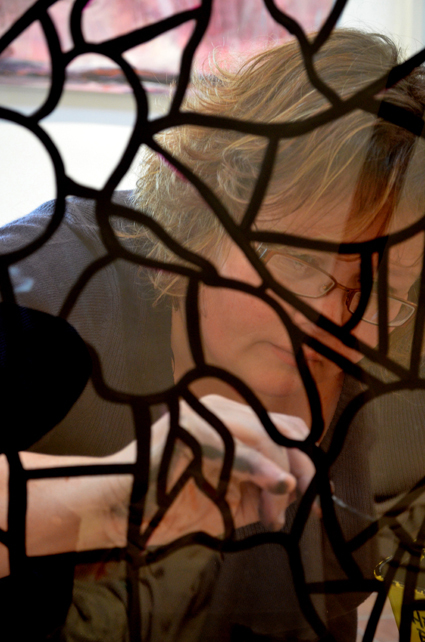 We have been ailing with seasonal bugs but have been enjoying painting up some glass and preparing pieces for sand blasting. 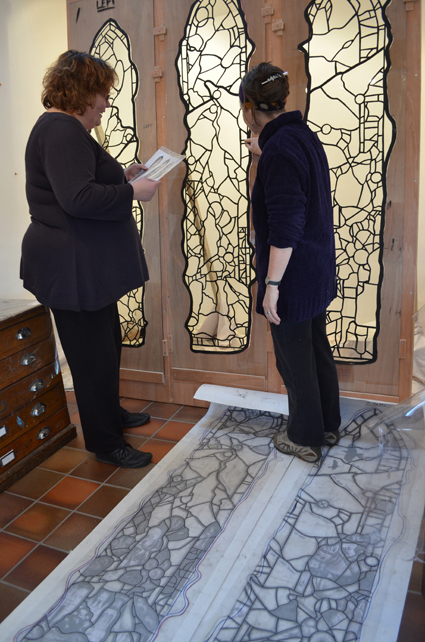 It is great to have the templates and cut lines up in the studio and to actually begin to assess light and colour. I went to a fantastic gig at Cuffern Manor this week, Julie Murphy and Ceri Owen Jones performed new pieces from their upcoming album, ably supported by Fiddlebox. Julie’s songs are tender and poignant and their collaboration embodies the best of traditional and contemporary work, poetry and music, and, amazingly, Ceri played a piece from the medieval ap Huw manuscript – one of the manuscript sources I have been consulting for my windows project…synchronicity at its best!…dreaming of a harp in the chapel..! I heard this morning that I didn`t get my funding to go to Northlands Glass in Caithness for an international glass conference called “Touching the Past” and to attend a masterclass with Michael Rogers. Michael Rogers is an amazing American artist who uses glass and found materials to make conceptual pieces. He also uses a lot of text in his work so you can see why I am interested to work with him. 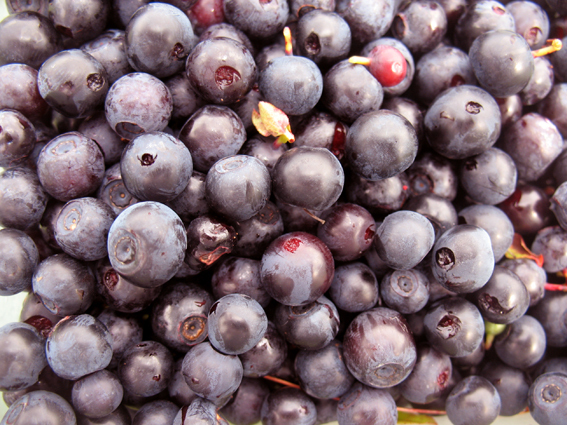 I have been accepted onto the masterclass and I am determined to go, so I went for a walk in the quarry and picked some bilberries while I figured out how to manage it. Lovely though they are, clearly the bilberries weren`t going to help out much financially, so I have decided to offer a 20% discount on all my work until I have raised the necessary £2000. 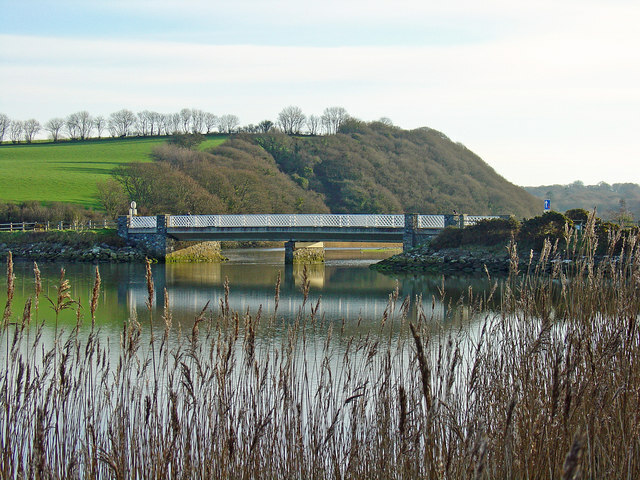 Do get in touch if there is anything you like on my website or call in to the gallery if you are in Pembrokeshire. Had a fantastic evening swim on Tenby South Beach with a friend after a day in the studio (not nearly as cold as I expected, and really refreshing! 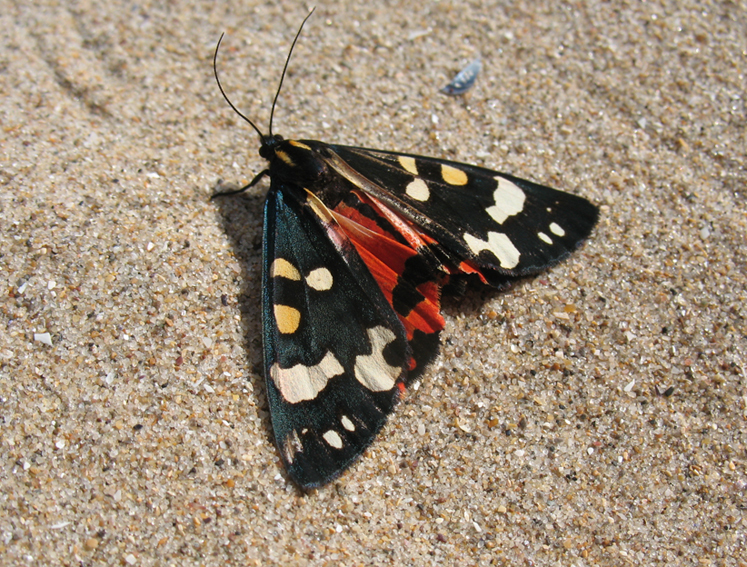 ), and then we came across this valiant Scarlet Tiger Moth on the sand…such exquisite colours showing petrol greens and emeralds over black and then a shock of poppy red petticoats….perfect end to my day.